It's always amazing to see the ways that marriage is celebrated in different cultures and the traditions and sacrament that makes up the day. We were honored to to be present at a wedding recently in Port Haywood, VA at the Inn at Tabbs Creek for a Hindu & Jewish combined ceremony. As you can imagine since this was a first for us, quite a bit of studying up on the traditions of both religions and contacting the couple back and forth to make certain everything would be captured went into to making this day run smoothly for our team. It was a beautiful outside ceremony at the bed and breakfast in mid-June and family had traveled from all over the world to watch the union of the couple. It was amazing learning about all of the traditions that went into both and the symbolism of what was taking place. 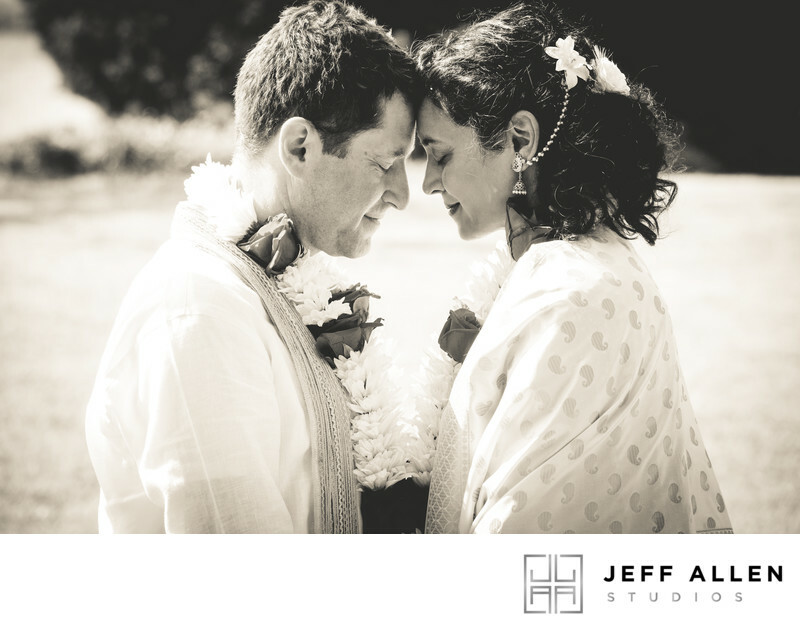 The photo of the bride and groom touching foreheads itself is symbolic and important to us that we capture that for them. I really love the peacefullyness of that image in the middle of a hectic wedding day. The wedding later concluding with the traditional Jewish breaking of the glass and then the couple took a short cruise around the lake in a private boat while the guests enjoyed cocktail hour. Location: The Inn at Tabbs Creek, 384 Turpin Ln, Port Haywood, VA 23138. Keywords: B&B (3), D810 (9), FOREHEADS (3), HINDI (3), HINDU (3), HINJEW (3), INN AT TABBS CREEK (3), Jeff Allen Studios (72), JEWISH (3), MULTICULTURAL (3), Nikon (12), PORT HAYWOOD (3), SEPIA (3), TABBS CREEK (3), TRADITION (3), VA (3), WEDDING PHOTOGRAPHY (9). 1/800; f/9; ISO 1250; 200MM.